Fr. José M. Urrate, S.J. Before the Novena, I should record certain historical facts about the origin of the devotion to Our Lady of Good Success of Quito. Surely, these facts will serve to kindle the fire of love in us for having such a good Mother and will motivate us to be more fervent in everything we do. The place where the story begins and where the beautiful devotion of Our Lady of Good Success found its origins is a renowned place: The Royal Convent of the Immaculate Conception of Our Lady of Quito. This was the first Convent of the city, founded on January 13, 1577, according to the chronicles of Rodriguez Docampo. “Mariana de Torres, professes and takes the name Mariana de Jesus; she made her vows on the 21st of September, the day of Saint Matthew, in the year 1579; she is one of the first novices." The Book of Professions says the same: “Mariana de Torres professes and takes the name Mariana de Jesus; she made her vows on the 21st day of the month of September in the year 1579” (3). It is very evident that Mariana de Jesus was a true pillar of the Convent by reason of the high virtue she attained and the titles she held. I record here only the number of times she was named Abbess. In the Book of Deaths of the Royal Convent it is recorded “Deceased: Mariana de Jesus, 6th Abbess. She was Abbess four times. She held the title during the periods 1598 -1601, 1610-1613, 1616-1619, 1622-1625; and continued to hold the title of President from 1625 to 1628. More explicit is the testimony of the well-known Rodriguez Docampo who speaks of this Convent in his famous Descripción y Relación del Estado Eclesiástico del Obispado de San Francisco de Quito [Description and Account of the Eccesiastical State of the Episcopate of Saint Francis of Quito]. Quoting from the processes of the Blessed Mariana (pg. 250), he states: “There have been (in the said convent) nuns of singular virtue and religion, such as Maria de Jesus Taboada, the first Abbess, and others who followed her example. “Resplendent from her youth in humility and obedience, penance and the gift of prayer, piety and devotion to Our Lord Jesus Christ, and love and reverence for the name of Jesus was Mariana de Jesus, one of the first who took the habit (in the Quito Convent). She lived and died setting a great example, spiritually and temporally, by her piety as well as her wise government, being Abbess various times. Her petitions and prayers were attended to by the Divine Majesty, and she received from His Mercy all that she asked. “She died with the same great peace and holiness as she lived. Her confessors stated in sermons at her burial and yearly records how she was zealous in the divine service and had merited great revelations from the Divine Majesty and His Holy Mother and the Child Jesus Whom she carried in her arms, and how she had the gift of prophecy. 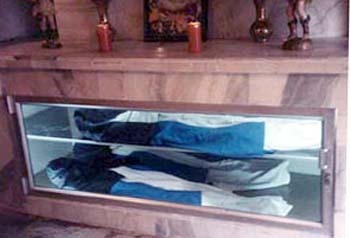 She received these prophetic gifts, in my opinion and that of Archbishop Pedro de Oviedo who dealt with, communicated, and confessed her and thus knew the prophecies she had made, so that God might be praised and blessed, as proof that He makes Saints and gives His Divine Spirit to whoever serves Him. They also relate other particular things about the divine favors she received, along with their verification, which will be told in further length in the story commissioned by me for this Royal Audience, in the presence of honorable priests” (6). I do not know if Rodriguez Docampo wrote the story that he promised or not. However, it is a known fact that Mother Mariana, before her death in 1635, had this consoling and marvelous revelation. It is common knowledge that one of the most well known churches in Madrid is that of Our Lady of Good Success. What is the origin of the invocation? After the death of Brother Bernandino de Obregón, founder of the Brothers Minor for the Service of the Sick (the Order of Saint Francis of Paola), Brother Gabriel de Fontaned was elected his successor. Accompanied by Guillermo de Rigosa, he set off for Rome to plead the case for official approval of their Institute before the Roman Pontiff. 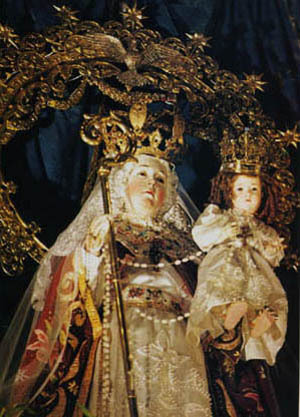 As they were passing through the town of Traigueras (under the jurisdiction of Tortosa in the Principate of Cataluna), they miraculously discovered in a cave in the mountains a very beautiful statue of Holy Mary carrying her Divine Son in her left arm and a scepter in her right, and a very precious crown on her head. This is how it came to be that this name was given by the Supreme Pontiff. 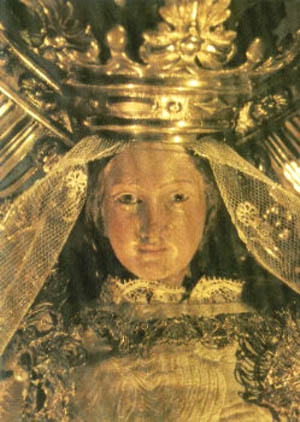 The Sacred Statue, which was placed in the Royal Hospital of Madrid, became famous for the numerous favors granted by Heaven through her. In 1641 Philip III ordered the construction of the splendid Sanctuary of the Puerta del Sol (Door of the Sun). The magnificence of this edifice that enshrines Our Lady of Good Success is renowned among the Churches of Madrid. The Spanish nuns who crossed the ocean to found the Convent of the Immaculate Conception in Quito brought with them a fervent love for the invocation of Good Success. They did not realize then that Holy Mary would deign to favor them in a very special way by means of this particular invocation. It happened in this way. It was the year 1610. 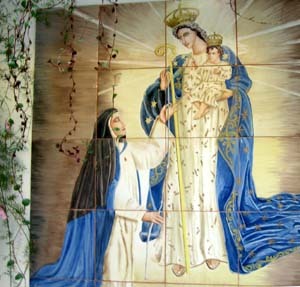 Mariana de Jesus Torres, who was then Abbess of the Convent and whose virtue was already well known, was distinguished for her devotion to the Virgin of Good Success. One night in the upper choir, as Mariana was praying before Our Lord in the Blessed Sacrament, recommending her community to the Holy Virgin, she noticed a soft light that suddenly appeared in the air. Enveloped in it was the Mother of God accompanied by angels. In her left arm she carried the Divine Child. The Heavenly Queen also told the humble sister that it was her desire, as well as that of her Divine Child, to be honored by this community as the principal Abbess until the end of time. Toward this end, she ordered her to have a statue made just as she appeared before her eyes with the title of Good Success, and that this statue should be placed for all times above the chair of the Abbesses who would follow her. From there she herself wanted to preside over the Community that she had adopted as her own. Taken aback by this request, Mother Mariana argued that it would be impossible to reproduce the majesty, beauty, size, and other characteristics of the Heavenly Lady in wood. In response, Our Lady ordered her to take off her cincture (a corded rope around the waist of her habit), and with this to measure her height, a process in which she herself helped by holding one end of it. After this, the Heavenly Lady said, smiling, that she could see to the rest of it by herself. Finally, she repeated her command, instructing Mariana de Jesus that in her right hand she should hold the crosier and the keys to the Convent since she had taken them for her own, thus assuring that the efforts of Satan to destroy it would be in vain. Therefore, the Virgin of Good Success of Quito appears with the crosier in her right hand, instead of the scepter that is shown in Madrid. The sisters of the Convent of the Immaculate Conception of Quito have always had a great love for their Heavenly Abbess. In addition, it would not be too much to say that the Statue of the Virgin of Good Success, once completed, has been one of the most beloved of Quito before whom the people have prayed for three centuries. We can say, then, that the Virgin of Good Success of Quito is a national devotion, like the devotion to the Image of Our Lady of Sorrows of the (Jesuit) College. Thus she has shown how she wants to take us under her special protection, and consequently, all persons should have recourse to her with great fervor and filial confidence. One of the principal ways of turning toward the Heavenly Lady has been by devoutly making a novena that is transcribed on the pages that follow. It is my hope that you will take these prayers to heart and make it well! May the Holy Virgin pour graces over your souls! 1. Document taken from the work Relaciones geográficas de las Indias by Marcos Jiménez de la Espada, Volume III, p. XXXIII, Madrid, 1965. 2. These books are preserved in the archives of the Conceptionist Convent in Quito. 3.These facts are taken from the Book of Professions and other documents kept in the Conceptionist Convent of Quito. 4. Foundation Book, fol. 37. 5. 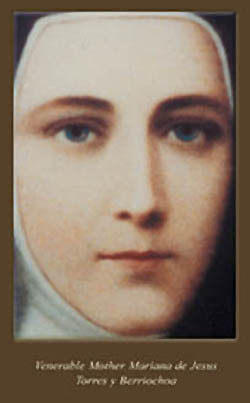 Blessed Mariana de Jesus is different from Mother Mariana de Jesus Torres of the Conceptionist Covent. The Lily of Quito, as she was known, was born in 1618 and became renowned for her holiness. Shortly after the death of Mother Mariana de Jesus Torres, the young woman became a hermit. During the 1645 earthquake in Quito and the epidemic that followed, she publicly offered herself as a victim for the city in the Church of the Company of Jesus, and died shortly afterward at age 27. She was beatified on November 10, 1853 by Pope Pius IX and canonized in 1950 by Pope Pius XII. 6. In Jimenez de la Espada, Relaciones geográficas.